Villagers walk as Mount Soputan volcano spews volcanic ash at Kota Menara village in South Minahasa, North Sulawesi, Indonesia, October 3, 2018. In addition to the growing death toll, hundreds of people were severely injured in Friday's disasters. 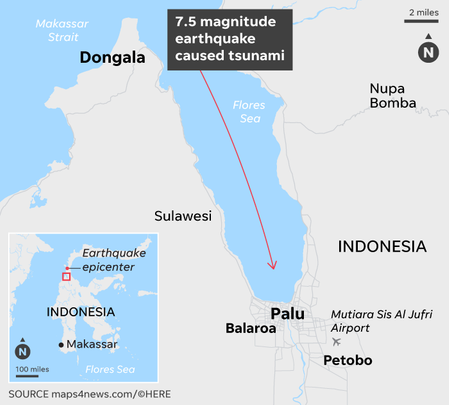 With many roads blocked and key communication lines and infrastructure destroyed, food, water, fuel and medicine are struggling to reach the hardest-hit areas outside Palu, the largest city heavily damaged. More than 60,000 people have been displaced, according to the National Disaster Mitigation Agency.